Cosen Band Saws, a leading bandsaw manufacturer and developer of MechaLogix, announced Al Warpinski has taken the position of regional manager of Cosen’s Midwest region, covering Illinois, Wisconsin, Minnesota, and the Dakotas. Warpinski has worked in the manufacturing industry since he graduated from Eastern Illinois University with a bachelor’s degree in journalism in 2013. His first job was an inside sales role with Perfection Servo Hydraulics in Batavia Illinois, which focused on repairing hydraulic components and industrial electronics. After a few years Warpinski took an area sales manager position with SK Hand Tool in Sycamore Illinois. More recently, he was the southwest Chicago account manager for DGI Supply. “While working at DGI Supply, I spent a majority of my time identifying and closing on Bandsaw Machines,” says Warpinski. “Often times when end-users were narrowing down their machine search, Cosen Band Saws were almost always in the mix. Warpinski believes Cosen is at an interesting point in its history and primed to take a big step forward over the next few years. 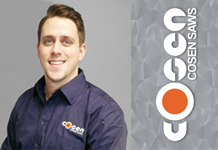 He welcomes the opportunity Cosen has provided to make his mark on the industry and grow with the company. Founded in 1976, Cosen is one of the world’s leading band saw manufacturers with a broad product line and a global sales network including Cosen USA and Cosen Europe. Cosen’s North American office and warehouse is located in Charlotte, NC. From there, the company provides an extensive selection of service replacement parts and local machine technicians. Their warehouse inventory contains over 100 new machines in stock and ready to ship at all times. Cosen offers 140 models including vertical, horizontal, miter-cutting, NC & CNC automatic and customized band saws. Capacity ranges from 7 to 126 inches; cutting materials from steel to titanium, chromium and silicon. The diverse cutting abilities of Cosen machines serve numerous industries such as construction, automobile, transportation, wind power generation, etc. Cosen was rated as the No. 1 Sawing Equipment Brand by U.S. Metal Center News in 2015. In 2016, the company launched its Industry 4.0 MechaLogix CPC App – positioning itself as the technology leader in band saw manufacturing.